If we want to set back community-police relations and return to the bad old days of the ‘sus’ laws of the ‘70s and ‘80s, when levels of mistrust between police and public were at record highs and had drastic consequences, then the introduction of a new blank cheque power to stop and question anyone, anywhere, anytime without reasonable grounds for suspicion, is a very quick way of achieving this. Neither the Metropolitan Police Authority nor the Metropolitan Police Service have called for this power because we understand the serious damage it could cause to the police’s relationship with London’s communities. Section 44 stop and search powers already give police the power to stop someone without having reasonable grounds, just by virtue of the fact they are in a specified geographical area at a time when police have satisfied the Home Secretary that there is a heightened risk. the MPS should conduct an annual MPS Equality Impact Assessment in respect to Section 44 of the Terrorism Act. 55. ACPO have released advice in relation to Section 44 which also deals with the issue of selection for searching, emphasising that the power can be used in both a targeted and non-targeted way but should never be based on stereotypical views of terrorists. In the absence of specific intelligence, search activity may be on a more random basis, with a wide range of people being stopped. This was of course not what happened in my case and the ACPO interim practice advice on stop of search does recommend behavioural profiling that is dangerously close to stereotyping. 61. There have been 19 complaints made in the MPS since Section 44 came into force in 2000, none of which were substantiated. In 2006 0.22% of Stop and Search activity (excluding Section 44) resulted in complaint. For Section 44, the figure was 0.01%. No formal disciplinary proceedings have resulted from complaints in relation to Section 44. However, 5 cases resulted in local resolution and the remainder were classified as unsubstantiated or withdrawn. All the locally resolved complaints related to incivility. This data has been selectively compiled. Following my complaint to the IPCC, several officers involved received disciplinary sanctions so my complaint cannot be counted in these ‘19 complaints’. The stop and search was found to be lawful and hence was not the direct cause of the sanctions, it is the ensuing arrest and search of my flat which were found to be unlawful and the general poor conduct of the investigation that were the justification for the sanctions. This likely explains why it is not counted in the figure mentioned. If I hadn't been stopped and searched none of the rest would have happened. There's likely a large number of similar cases where complaints that could and should be attributed to stop and search will be counted only in some other category. Note: Thanks to DW for pointing out the MPA press release in the comments of the excellent Police not consulted post by UK Liberty. Yesterday in a leaked letter to the Prime Minister, Tony McNulty, the Counter-Terrorism Minister, outlines the Home Office proposal to give powers to the police to stop and question people. People refusing to give their names or explain what they were doing could be charged with obstructing the police and fined up to £5,000. A year ago nearly to the day, I asked a question at the Metropolitan Police Authority (MPA) about the stop and searches conducted in London under Section 44 of the Terrorism Act 2000. And only a few months ago, the MPA issued recommendations asking to ‘stop using it, other than in exceptional circumstances’. If this terrible proposal still goes forward after Tony Blair and John Reid leave office, how many more of us will become ‘suspect’ or future ‘former suspect’? The Home Office published the Annual Report for 2005-06 of the National DNA Database (NDNAD) Board and ElReg reveals that between 1995 and 2005 approximately the NDNAD unit tried to load 126,200 erroneous records onto the database, of which only 26,200 were stopped by the system. Today is a great day for Mouloud Sihali, his supporters and for justice. Although we do not approve of the SIAC system, with its shadowy policy of closed court sessions and secret evidence, which the defendant and even his lawyers are not allowed to see, we are grateful that Justice Mitting and his colleagues have reached a sensible conclusion. Mouloud Sihali is judged not to be a threat to national security; something that we jurors have always firmly believed. We hope now that Mouloud Sihali can be left to live his life in peace and at last has the freedom to make a choice as to what he does with his future, without the damning label of “terrorist” or “threat to national security” hung around his neck. In a written answer, John Reid gave detailed historical data on DNA subject sample profiles added to and removed from the National DNA Database (NDNAD). Removal of the DNA profile as explained in the ACPO's Retention Guidelines for Nominal Records on the Police National Computer is done only in exceptional cases. My DNA profile was added in 2005-06, I look forward to increasing the number of DNA profiles removed in the current financial year. The relevant Chief Police Officer has to authorise the removal of my bioinformation and the destruction of the samples. On a partially related note, I have just received from the IPCC its final decision in my appeal against the outcome of the police complaints investigation. My approach has always been to do funny books about serious issues because I think you can reach more people by being entertaining as well as informing. My original idea was to write a guide to some of the most absurd ancient legislation still on the statute book. I’d had this great idea to go round the country on a crime spree, breaking as many silly old laws as I could find: imagine if Fred Dibnah met Bonnie and Clyde. However, in the process of researching these laws I couldn’t help noticing another glut of legislation that seemed even more ludicrous. Most of our silly laws have trickled onto the statute book over centuries, but this particular set had all come from our current government. And when you meet a man who got arrested after eating a cake with “Freedom of speech” written on it in icing, and someone else who has a criminal record for holding a banner made of fridge packing in Parliament Square that had “Freedom of speech” written on it in Biro, the idea of breaking the Adulteration of Tea Act of 1776 starts to seem a little frivolous. 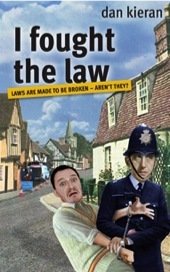 This book is about my journey to break the strangest law in Britain. Now people will expect it to be all the odd and eccentric laws of the past but because I'm writing it in the current climate, I want to highlight how our freedom is being eroded. An interview with you to tell your story would point out that you can now be arrested for literally doing nothing. The chapter called Britain's Ten Worst Laws which Dan wrote in conjunction with civil rights campaign group Liberty opens with this interview.